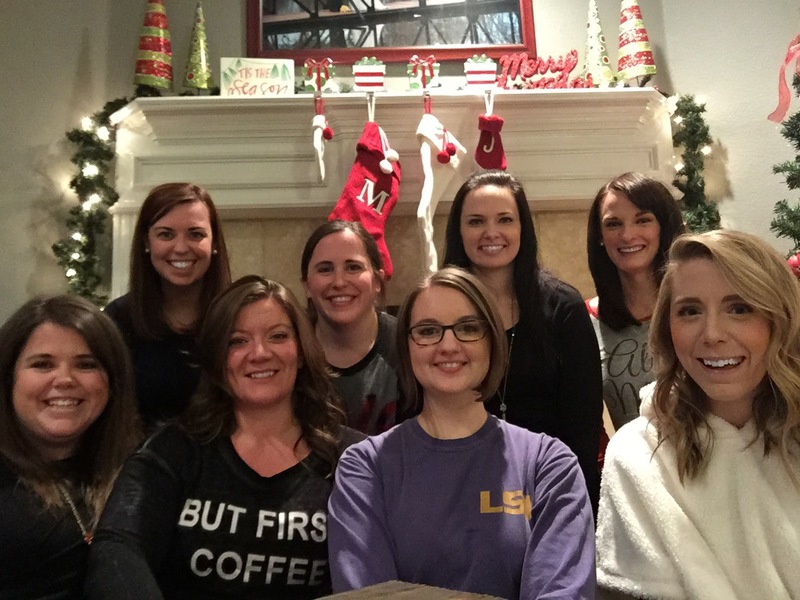 This year I decided to throw a Girl’s Christmas Party for my Dallas girlfriends. We use to see each other multiple times a week, but as the years have gone on see each other less and less due to busy schedules. I wanted to plan a special evening for us to celebrate the holidays. Originally we were going to do a scarf exchange/PJ party, but then Pinterest inspired me to do a “Favorite Things” party. It was so much fun! Today I’m going to show you a few photos from the party! 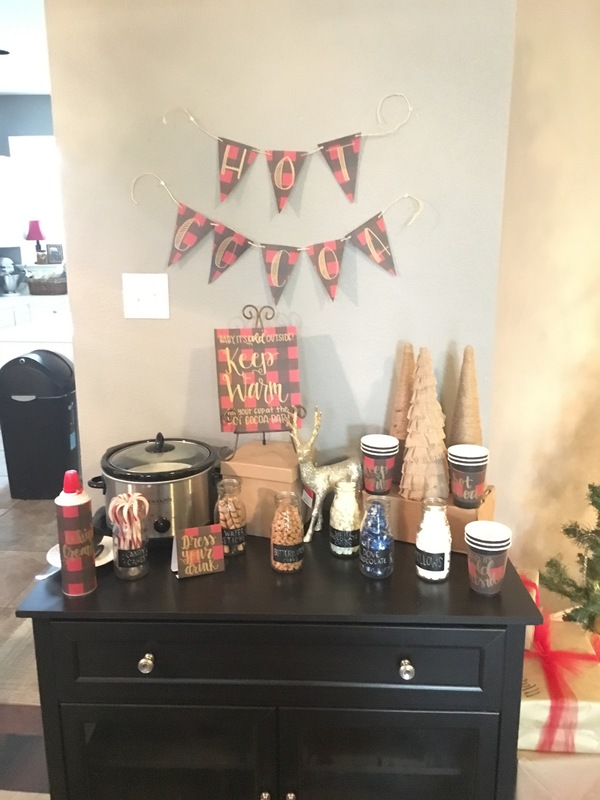 I was inspired by this blog post I found on Pinterest to create a Hot Cocoa Bar.This was so fun to recreate! I got black and red plaid paper from Hobby Lobby, and I also got the milk jars from Hobby Lobby as well. I had a bunch of different toppings for people to add to their hot cocoa. My personal favorites were the Whip Cream, Candy Canes, and White Chocolate chips! 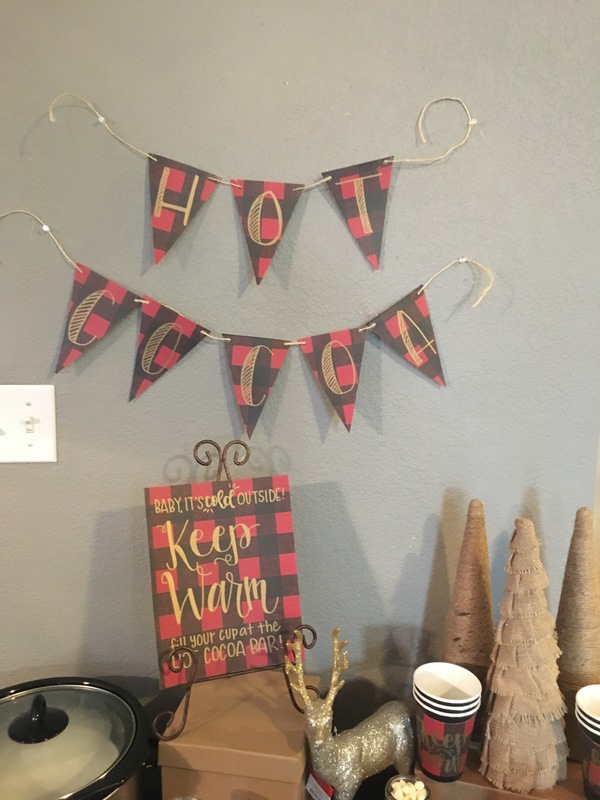 I recreated this sign from the pinterest post that I saw. It’s pretty much identical, but I didn’t want to print the one on the post so I just wrote it out with a gold metallic sharpie. 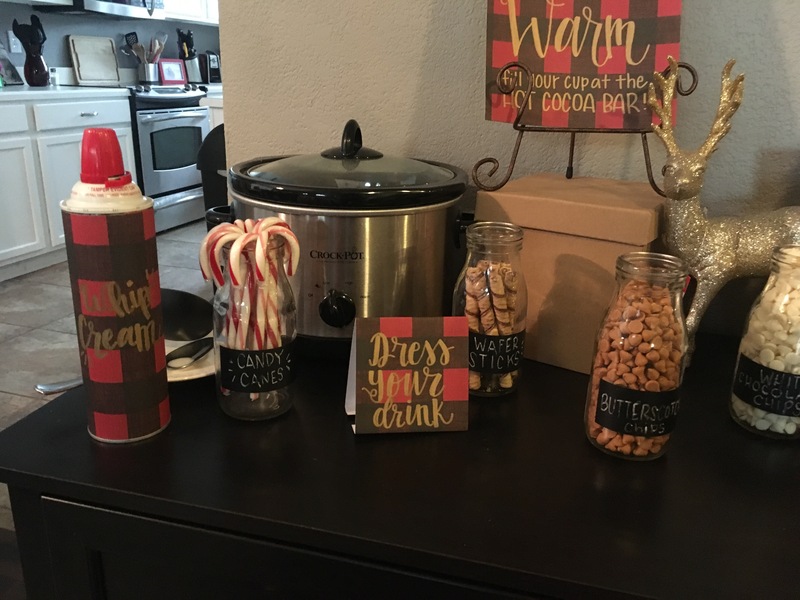 The hot cocoa recipe that I made was from this post on pinterest. It was the first time that I made this recipe, and it was to DIE for! One of my friends said it tasted like Angel Tears. It was seriously the best hot cocoa I have ever had! I’m making it again on Christmas Eve Eve when my family comes over! I bought these brown paper gift paper gift bags from Michaels and wrote out “These are a few of ______’s favorite things” with a brush marker. We had 8 people attend the party, so each person picked one small gift that was currently their “favorite thing” and they brought 7 of those items. They then put one in each person’s bag as a gift! I will go over later what everyone brought as their “favorite thing”- they each had the perfect personal touch to them! We had one friend who had to work late, so while we were waiting for her to arrive we had a Gingerbread House decorating contest. Decorating gingerbread houses is one of my favorite things, so I thought it would be fun to do together. 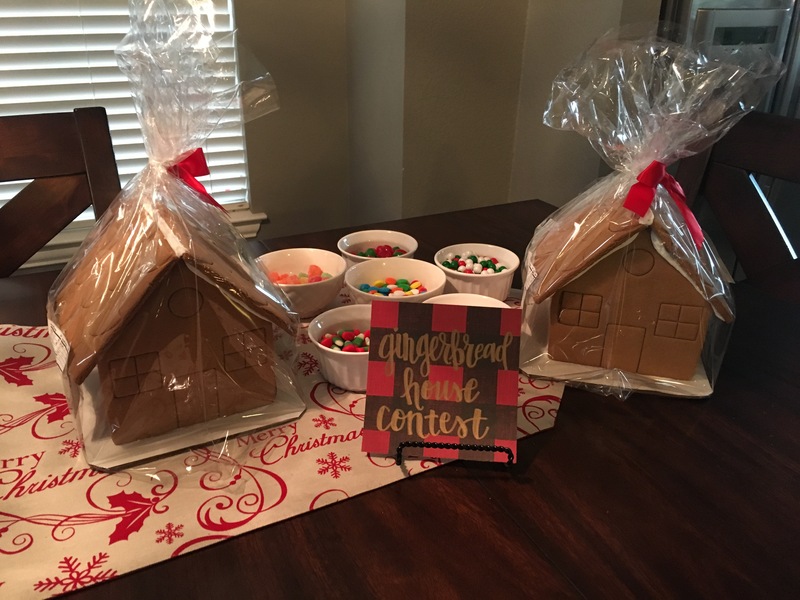 We had so much fun decorating these houses! 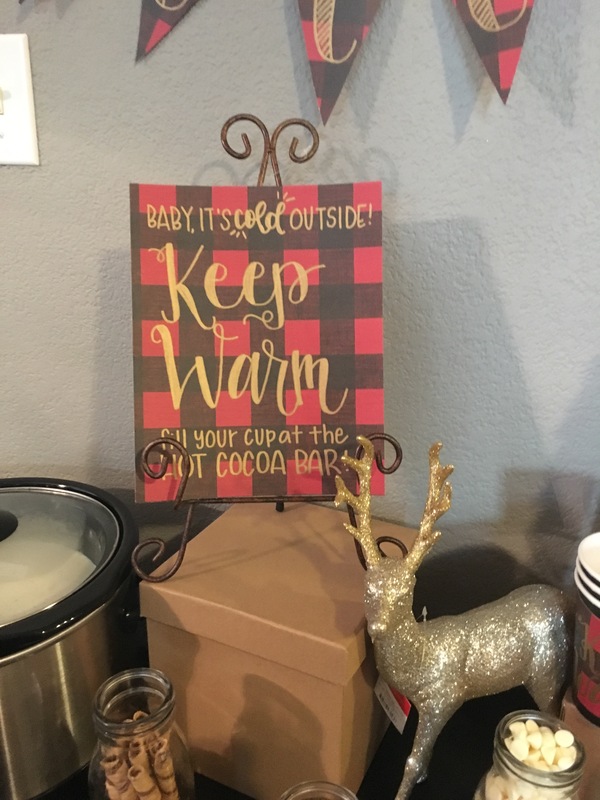 I was able to find black and red plain paper goods at Target to match my theme, so those items were put on the food table. I thought they were so cute! The sign on the food table said “These are a few of our favorite treats”. Everyone brought their favorite snack item to share! We had all kinds of goodies from Christmas cookies to queso to fruit to pigs in a blanket! It was lots of good snacks! 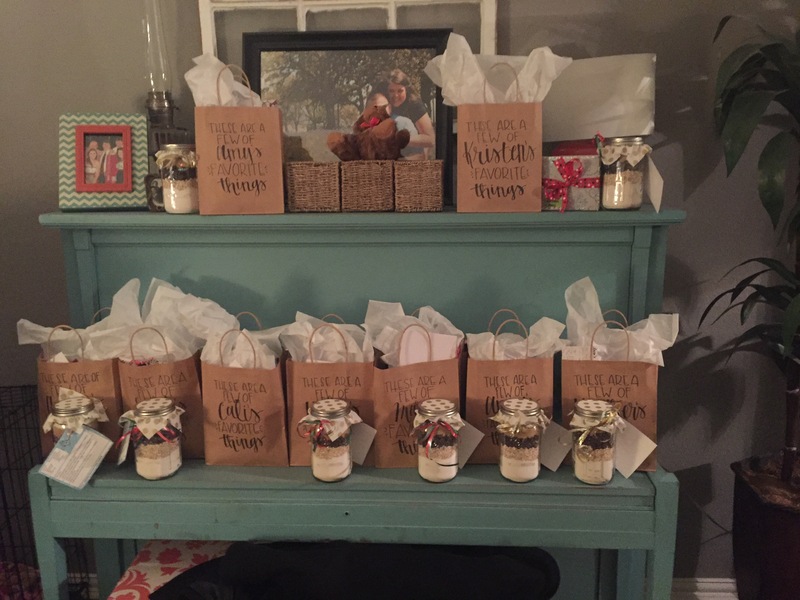 Here are all of the gift bags before we started opening them. They were packed full of goodness! When it was time to open gifts, each person explained what they brought and why it qualified as one of their “favorite things”. It was so fun to see what everyone brought! Here is a photo of all the goodies! I’m going to explain what each person brought below and why it was their favorite thing. Me: Mini Happy Planner- Of course! What else would I give? Most of these girls have not gotten into the planner craze, so I decided to get them minis because I thought it was the perfect place for them to start! Anna- A cookie cutter with her SECRET chocolate chip recipe attached! This is a top secret recipe that she has perfected through the years and doesn’t share with ANYONE! What a fun gift to share! Mary- a Lush Bath Bomb. I’ve never used one, but they are suppose to be AMAZING and so relaxing. I can’t wait to grab a glass of wine and a good book and try this one out! Kristen- Adult coloring book & Crayons- Kristen is really into adult coloring books, and I’m right there with her! They are so fun and relaxing. It was amazing to hear how many girls had never gotten an adult coloring book! I can’t wait to start coloring in this one! Holly- Holly’s favorite thing to do is sew, and she sewed us each our own infinity scarf. She did an amazing job of picking a unique pattern for each person, and they are so beautifully made! I love mine! Sarah- A cucumber face mask- she said she loves face masks and wanted to give everyone one to try out for themselves! Amy- Christmas Salt & Pepper Shakers- she said she had gotten a set for herself and thought they were so cute and festive. I LOVE mine because it matches my Santa cookie jar perfectly. This is so cute! Cali- A jar of ingredients for oatmeal chocolate chip cookies because they are her favorite! I have to agree with her- they are so good! I can’t wait to bake these! Aren’t all of those gifts fun?? It was so fun to see what everyone brought as their “favorite” gift and to share it with everyone! And of course, these ladies are my absolute favorite. We have all been friends for so many years now, and it’s so fun to be friends through all of our new life stages. I am so thankful to have these Godly women in my life! They are more like sisters than friends. It was so fun to spend a night celebrating Christmas and our favorite things together! We already can’t wait to have this party again next year!